Welcome to our Ear Thread Collection. 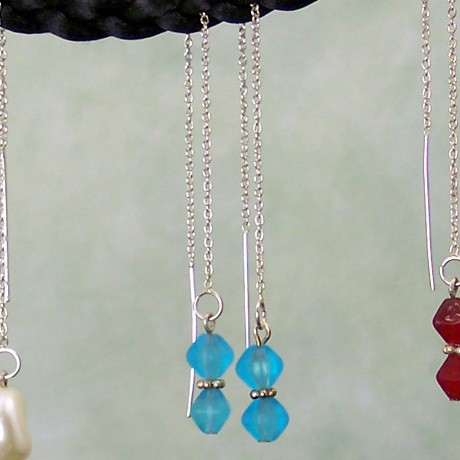 All ear threads are sterling silver or 14KT gold vermeil with genuine swarovski crystals, freshwater pearls and/or semiprecious stones. Click on any photo for close-up! 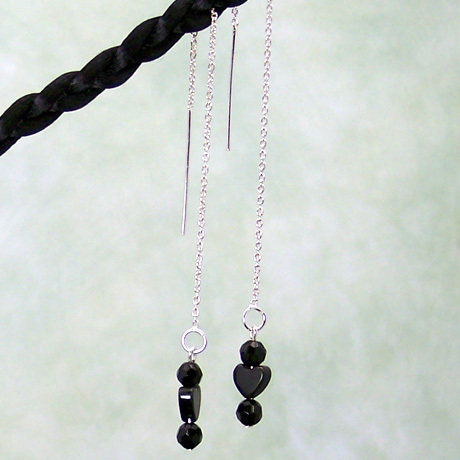 You can decide the length of your earring drop (from about 3.5 to 4.5 inches) by adjusting the length of the chain at the back of your ear, thereby raising or lowering the drop at the front of your ear. Can't wear ear threads because your piercing is elogated? 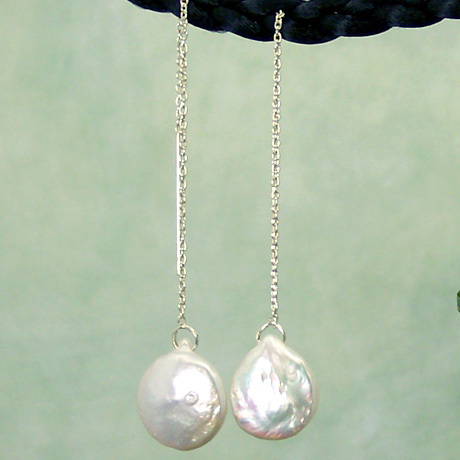 Are you afraid you will lose the earring from your ear? If so we now have an answer to your problem! 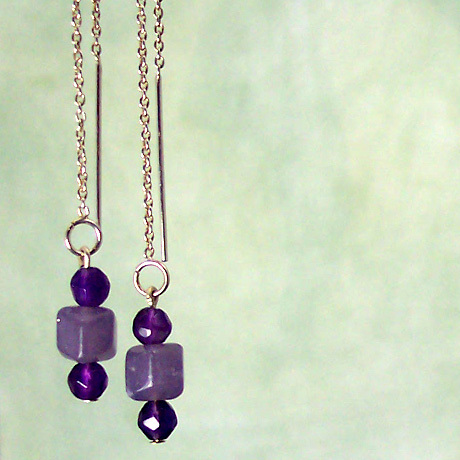 Ear Thread Stoppers. 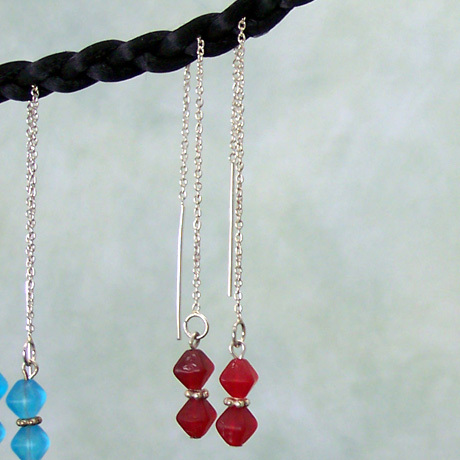 These niffty little beads will slide up and down on the ear chain so you can adjust the length but not lose the ear thread. 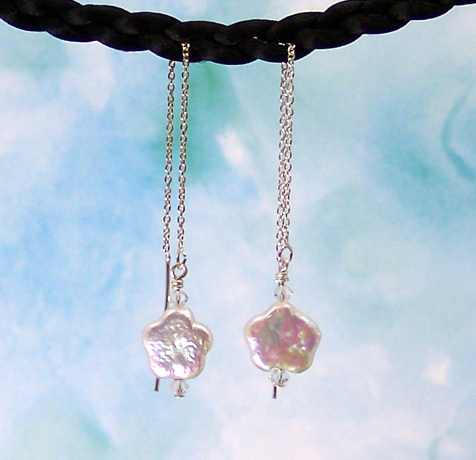 They are available in 14kt G.F. and Sterling Silver and come with complete instructions how to use them. 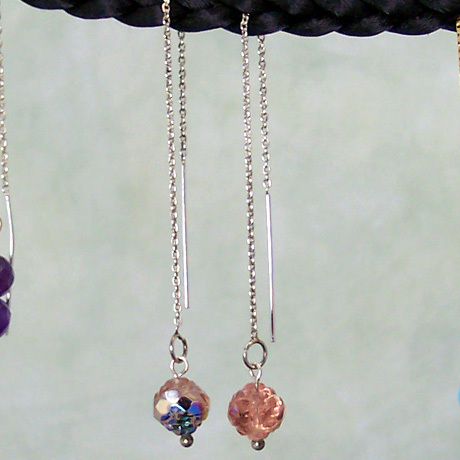 Click on ETS001 and ETS002 to view or buy our Ear Thread Stoppers. 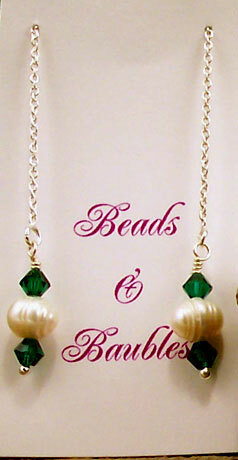 12 mm pale green Freshwater Coin Pearls with chrysolite Swarovski crystals and Sterling Silver Bali bead accents. 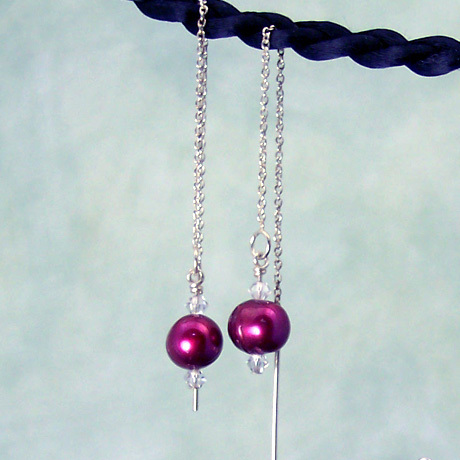 Threaded on Sterling Silver head pins and suspended from Sterling Sliver ear threads. 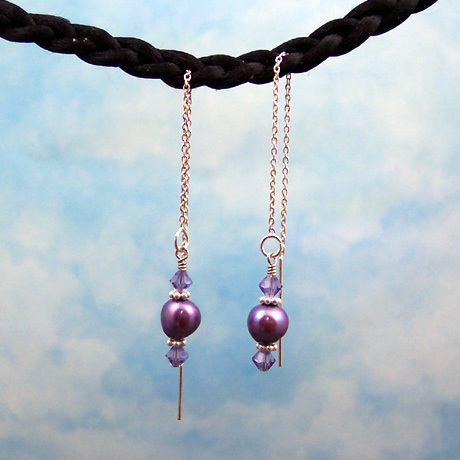 Sterling Silver Ear Threads with 10 mm flower shaped coin pearls and Swarovski crystals. 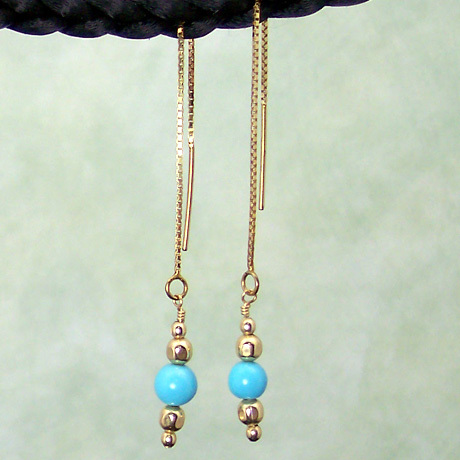 7 mm round gem quality sky blue Turquoise beads cradled between 4 mm faceted round and 2.5 mm seamless round 14KT G.F. beads, threaded on 14KT G.F. head pins and suspended from 14KT Vermeil box chain ear threads. 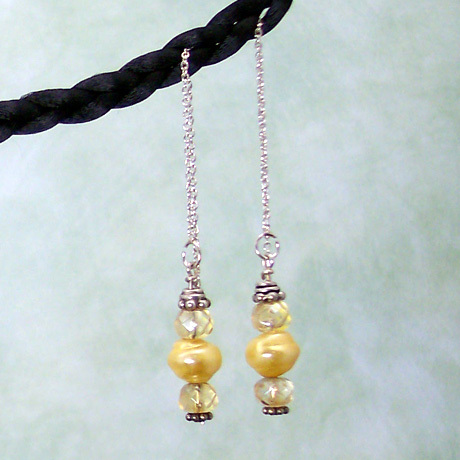 5 – 7 mm white Baroque Fresh Water pearls and Czech Rosaline colored roses of pressed glass and hung from Sterling Silver ear chains. 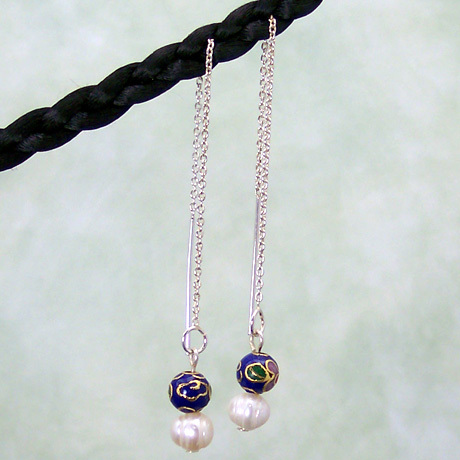 Made of Baroque Fresh Water pearls and Czech gemstone colored roundels of pressed glass and hung from Sterling Silver ear threads. 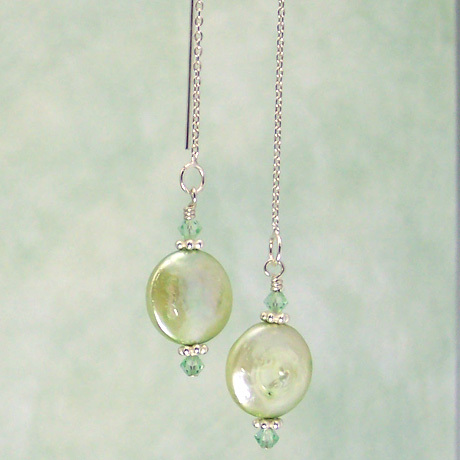 Available in Crystal or Rose. Pictured in rose. 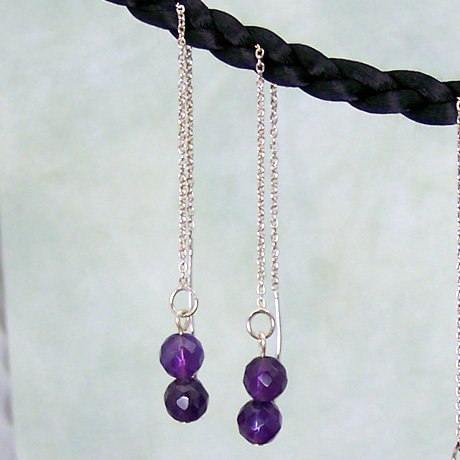 4" long Sterling Silver Ear Threads made with Lepidolite Crosses and faceted Amethyst rounds. 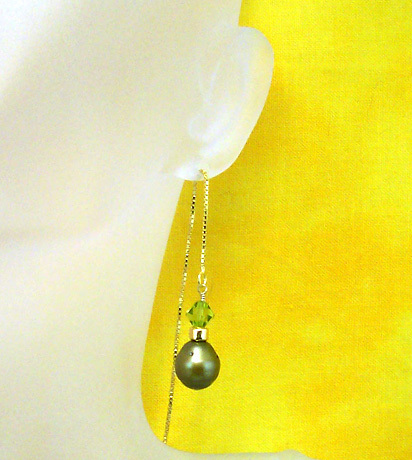 14kt G.F. ear thread with a Olive Green freshwater pearl dangle accented by a 6 mm Olivine Swarovski crystal and a 24kt gold ceramic bead.